Intermediate Court of Appeals Chief Judge Lisa M. Ginoza, left, and Island Focus host Lyla Berg. 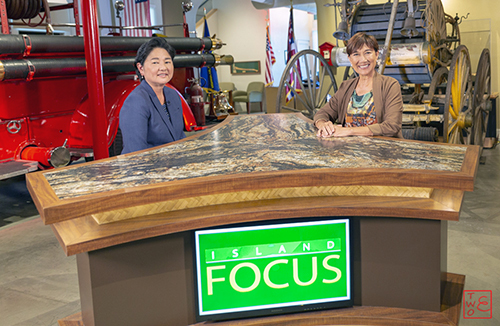 Chief Judge Lisa M. Ginoza talks about the role of the Intermediate Court of Appeals in the justice system on Island Focus this week. Her interview premieres at 6:30 p.m. on Wednesday, April 17, 2019 on Spectrum Cable channel 53 and Hawaiian Telcom channel 53 and 1053 (HD) It will re-air at 4:30 p.m. on April 21 and 28. You can also view the program on-demand at olelo.org/olelonet or on ‘Ōlelo’s Youtube channel two days after the premiere date. Mahalo to Chief Judge Ginoza for taking the time to educate our community about the ICA and promote a better understanding of the judicial branch of government.